We have created blends, from the following grape varieties of our estate in Bas Armagnac :Colombard (20%) and Ugni Blanc (80%). 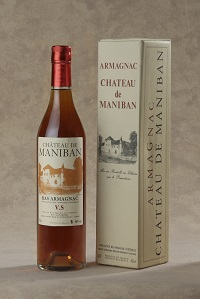 This Armagnac is the youngest one of our range. It's a blend of at least 3 years old. (beyond the minimum legal age of 1 year). More powerful and aromatic, it can be served with ice as an aperitive or as a long drink with a tonic or a fruit juice of your choice. 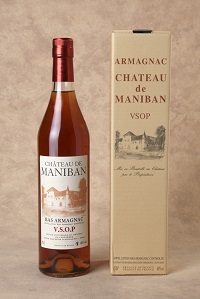 The appellation VSOP means a minimum legal ageing of 4 years in wooden cask. 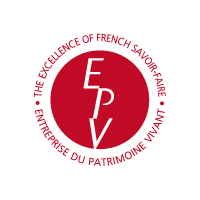 Our VSOP is a blend of eaux de vie which have aged between 6 years in wooden cask in our cellars. Robe: Amber, clear and limpid. Nose: Very natural and has a great and surprising freshness. Mouth: is also very fresh with some touches of prune aromas. 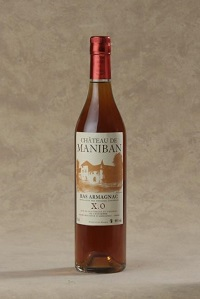 By the rules, XO Armagnac must have at least 10 years in oak. Our XO is a blend with a minimum of 12 years aging in oak cask. Clear coppery. It has animal flavours like fur and leather. This Bas Armagnac has a smooth attack, very agreeable. It also has pleasant aromas of ripe prune and spices without any asperity. It is very well balanced and thanks to its numerous qualities it has been awarded several times. 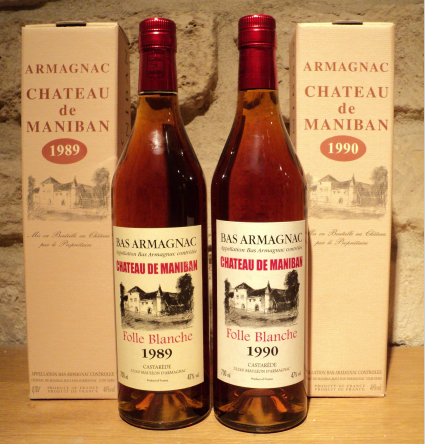 Our Armagnac vintages are 100% Folle Blanche. They are available under our brand name Castarède. White eau-de-vie, limpid and bright. The nose is elegant and very aromatic with aromas of liquorice and fennel. Then an intense floral note takes over. These aromas of white blossom contribute great elegance. The attack in the mouth is clean and displays incredible freshness. The structure has great complexity and is very round on the palate. The retro-olfaction with notes of spices (pepper) and roasted cereals finishes with a lovely "peacock's tail" (long and intense finish in the mouth). Serve with a pear granite with a touch of saffron. Topaz eau-de-vie with lovely coppery green highlights, bright and limpid. The nose with aromas of prunes with spices finishes on a buttery note. After aeration, aromas of mushroom, wood and damp earth appear. The attack in the mouth is clean and balanced; the sensation of alcohol is supple and well integrated; complex and well achieved; liquorice on the finish brings the tasting to an agreeable end. Serve with a fig tart or as a digestive. Amber eau-de-vie with coppery green highlights, bright and limpid. The nose with great elegance stays with vanilla notes from the ageing and a little touch of scorched wood. The attack in the mouth is clean with lovely balance; the sensation of alcohol is still quite powerfull and the good quality tannins add a note of liquorice, the finish is very peppery with notes of dried bracken, humus and roasting. Serve with a mild coffee like a Blue Mountain or with an almond macaroon.